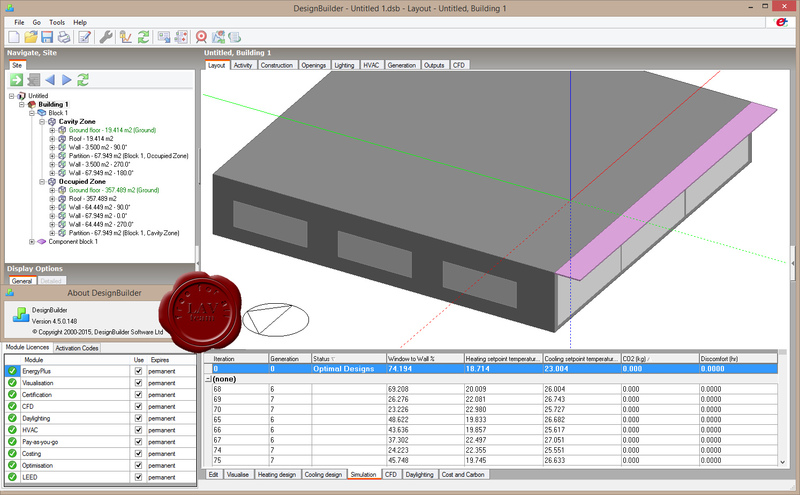 DesignBuilder is a state-of-the-art software tool for checking building energy, CO2, lighting and comfort performance. Developed to simplify the process of building simulation, DesignBuilder allows you to rapidly compare the function and performance of building designs and deliver results on time and on budget. DesignBuilder features an easy-to-use OpenGL solid modeller, which allows building models to be assembled by positioning, stretching and cutting 'blocks' in 3-D space. Realistic 3-D elements provide visual feedback of actual element thickness and room areas and volumes and there are no limitations on geometric form or surface shape. You can import 3-D CAD models from ArchiCAD, Microstation, Revit and any other CAD software supporting the gbXML standard. Data templates allow you to load common building constructions, activities, HVAC & lighting systems into your design by selecting from drop-down lists. You can also add your own templates if you often work on similar types of buildings. This, combined with data inheritance, allows global changes to be made at building, block or zone level. You can also control the level of detail in each building model allowing the tool to be used effectively at any stage of the design or evaluation process. Switch between Model Edit View and Environmental performance data with a single click - data is displayed without the need to run external modules and import data; and any simulations required to generate the data are started automatically.